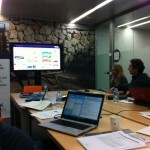 Web SpeakApps» Blog Archive » SpeakApps 2 Kicks Off in Barcelona! SpeakApps 2 welcomes its associate partners to the SpeakApps community and is excited to be working with them. The SpeakApps 2 team will facilitate workshops for participants in the project’s target languages. The aim of these workshops is on the training of teachers to incorporate SpeakApps resources within their language teaching methodologies and practices. The SpeakApps Open Educational Resources (OER), will act as a central hub for participants to access resources and participate in the SpeakApps community. Check out the SpeakApps tools, LangBlog, Tandem, VideoChat and the OER. To get involved in this project, contact speakapps@uoc.edu or alternatively the project team, details are available here. Further Information about workshops will be posted in the coming months.